"There are two kinds of people in this world: the ones who don't cook out of and have NEVER cooked out of THE I HATE TO COOK BOOK, and the other kind...The I HATE TO COOK people consist mainly of those who find other things more interesting and less fattening, and so they do it as seldom as possible. Today there is an Annual Culinary Olympics, with hundreds of cooks from many countries ardently competing. But we who hate to cook have had our own Olympics for years, seeing who can get out of the kitchen the fastest and stay out the longest." - Peg BrackenPhilosopher's Chowder. Skinny Meatloaf. Fat Man's Shrimp. Immediate Fudge Cake. These are just a few of the beloved recipes from Peg Bracken's classic I HATE TO COOK BOOK. Written in a time when women were expected to have full, delicious meals on the table for their families every night, Peg Bracken offered women who didn't revel in this obligation an alternative: quick, simple meals that took minimal effort but would still satisfy. 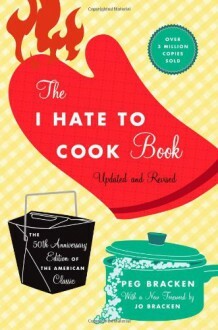 50 years later, times have certainly changed - but the appeal of THE I HATE TO COOK BOOK hasn't. This book is for everyone, men and women alike, who wants to get from cooking hour to cocktail hour in as little time as possible. After flipping through this quickly, I decided that this book should be called "The I Hate to Cook Book or How I Learned to Slowly Kill Myself via Casserole"